We not only use language for daily communication; we also use language to express our identities and cultures and to represent our lifestyles and communities. So, as we all know, the loss of language is loss of both culture and identity of the community speaking the language. Because communities that lose their languages–and thereby their culture, identity, and pride–also lose their status and confidence in society, the process of language loss often leads to broader and adverse social consequences such as marginalization, poverty and poor health, social evils such as drug abuse, and so on. Hence, it is important to preserve languages in the world, especially the languages of the minority groups. Those who are ignorant about the value of language diversity tend to believe that communities that adopt a more dominant/mainstream language “gain” new power and opportunity; they even go to the extent of arguing that linguistic minorities shed the burden of multiple languages when they leave behind their local languages. The truth about multilingualism, however, makes such understanding absurd. Language is the key to engagement and therefore to sustainable development. The World Bank Research Report titled “Assessing Aid: What Works, What Doesn’t, and Why” (1998) showed that development initiatives that sought beneficiaries’ involvement achieved 68 percent success, while those that did not achieved a success rate of just 10 percent. Engaging with the beneficiaries needs the use of their local languages. Such a linguistic and cultural immersion with the target communities contributes to establish two-way communication for people’s meaningful participation and to adopt bottom up approaches in order to achieve sustainable results. Trying to supplant local languages with outside language (whether that is done for efficiency or in the name of “empowering” local communities) is like trying to make one’s neighborhood greener by cutting down existing trees and planting new ones–or worse. Language is the key to inclusion and inclusion is a must for democracy. For instance, Nepal being a multiethnic and multilingual country will become a true democratic nation when it fully overcomes more than 250 years legacy of linguistic and cultural discrimination against indigenous and minority groups. It is only possible when children of minority groups are provided with the access to education in their mother tongues. Promoting multilingual education in the country–where minority language communities can build upon their local linguistic, cultural, and knowledge resources even as they learn new languages–is a roadmap for true democracy. In particular, the promotion of local languages is the key to effective education. Education is a basic human right in international law, widely accepted by governments throughout the world, and language is a medium of instruction as well as a subject matter to achieve the basic human right of expression and self-realization. Insights like the above brought together hundreds of educators, linguists, government and civil society delegates and development workers from the Asia Pacific region and beyond at the fourth international conference on language and education recently convened by the consortium of organizations ‘Multilingual Education Working Group (MLE WG)’ in Bangkok, Thailand from Nov 6 to 8, 2013. Representing a development activist and educationist from Nepal interested in MLE, I attended the conference on the theme ‘Multilingual Education for All in Asia and the Pacific: Policies, Practices and Processes’. The theme was very relevant as it provided a common platform to adopt a common understanding of MLE and its importance in Asian context. This conference did showcase promising practices so as to increase understanding of the importance of expanding access to effective MLE and strengthen the momentum for this issue in the AsiaPacific region. The event did not only determined the factors that enable effective, efficient and sustainable MLE by sharing challenges and lessons learned from current MLE practice but also identified recent policy developments in the Asia-Pacific region. The researches and papers presented in the conference revealed that the role of MLE network and collaboration with the governments, non-government organizations, universities and language association played a significant role in making the government formulate and revise education policies in respective countries and putting the MLE practice into action at schools. The research studies and papers on policies and practices towards multilingual education in Nepal occupied a substantial space in the conference. Altogether eight different research studies and papers were presented by Nepalese MLE practitioners, academician and NGO activists. Director General Dr. Lava D. Awasthi from Department of Education, Nepal and profound linguist Prof. Dr. Yogendra Prasad Yadava from Tribhuvan University, Nepal talked on multilingual education in terms of policy manifestations and pedagogical practices in Nepal and MLE policies and practices in Nepal as an appraisal respectively. Both the papers showed the variations, challenges and gaps in MLE practices introduced by Government of Nepal as well as national and international agencies in the country. Even though Nepal is a multilingual and multiethnic country with 123 languages and more than 103 ethnic communities, children in most ethnolinguistic communities are deprived of basic education in their respective mother tongues. Teaching in unfamiliar languages has hindered cognitive development in the children. Language not only helps promote equality and empowers people but also is a key factor for the social inclusion in ethno-linguistic communities. MTB-MLE is the most important mechanism for achieving the goal of education for all among minority communities. However, the policy adopted by the government is not conducive for such a purpose. Curriculum and textbooks as well as reading materials are not compatible to the socio-cultural setting of the communities. Making these arguments in her paper, Dr. Ambika Regmi from Tribhuvan University concluded her sharing claiming that only appropriate strategies can access to MTB-MLE be guaranteed in all ethno-linguistic communities of Nepal. Reviewing the education policies addressing minority language use in basic education in Nepal, Pushker Kadel, director of Language Development Centre, an NGO shared the impact on the community, students and teachers of pilot MLE programs initiated by Department of Education in eight languages and MLE projects initiated by I/NGOs. Blending his own experience of MLE initiatives taken by local NGOs and the reported outcomes of the existing MLE projects, kadel made recommendations for effective MLE practices in Nepal. 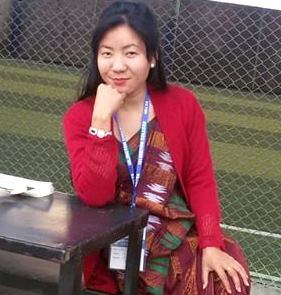 (NNLPI) an NGO and Kimiko Abe from Summer Institute of Linguistics (SIL) Nepal presented a case study of a multilingual education (MLE) program implemented in the Rajbanshi speaking areas of Jhapa and Morang in southeast Nepal. This case study showed how a quality MLE program can provide efficiency, effectiveness, and sustainability of education for students who speak non-dominant languages. The case study also illustrated that high quality program can persuade local governments of the value of providing education in the students’ strongest language, creating a sustainable policy and funding environment for MLE program. The three key factors that made the Rajbanshi program successful included community involvement as implementers of the program, child-friendly teaching methods and environment and capacity building and professional development support to the teachers. Similarly, undertaking another case study of a Rajbanshi medium school in Jhapa of eastern Nepal, Surya Prasad Yadav from Tribhuvan University Nepal shared MLE practices in Nepal through his paper. The findings of his studies showed that children from Rajbanshi-medium school are more motivated towards education and are more regular in class attendance. Owing to the use of the mother tongue, the rate of their dropouts has decreased and there has been a reduction in the number of out-of-school children. Finally, he discussed the ways to address the challenges of MLE practices in that case and further claimed that such a case could be replica for other similar schools in the country. The Rana Tharu language spoken by Rana Tharu community, indigenous inhabitants of Kailali and Kanchanpur districts from far western Nepal, is gradually being lost due to dominant language Nepali, which is only medium of instruction used in schools and literacy class. Children from such community face difficulties in education due to Nepali and English being the medium of government and private schools respectively. Literary rate of the community is lower than that of Nepali-speaking communities. Presenting the above linguistic contexts, Prithivi Chaudhary from Transformation Nepal, an NGO shared another case of MLE practice from Rana Tharu Community, which showed a perspective on language development for the sustainable use of Rana Tharu in schools and literacy classes. The findings carried out from a linguistic survey utilizing participatory tools, informal interviews and observations conducted in Kailali and Kanchanpur in 2012 show that Rana Tharu community lacks access to education, particularly in the mother tongue and lags far behind other Nepali communities in awareness, development and technology. Literacy programs in rural Nepal are quite common, but practitioners often experience low literacy rates among these rural communities. One difficulty related to literacy programs in Nepal is that many people do not speak Nepali as their first language, but literacy programs are required to teach literacy in Nepali. However, the joint presentation by Yee-may Chan fromSIL Nepal and Chhejap Bhote fromNepal Lhomi Society (NELHOS), an NGO strongly argued that literacy programs are allowed to teach literacy in another language, as long as literacy in Nepali is included at some point. Their paper explained how the Lhomi Mother Tongue-based Multilingual Education (MTB-MLE) Adult Literacy program applied principles from MLE programs designed for children to literacy programs for adults. For instance, culturally appropriate mother tongue teaching materials relevant to the participants’ daily lives were created and used; teaching materials used in the classrooms moved from simple to complicated, from known to unknown; the participants’ mother tongue was the medium of instruction. The experience of the program showed that participants mastered basic literacy, numeracy skills, and simple mathematics within five months. Their experience further showed that after participants learned to read in Lhomi, they quickly learned to read Nepali (which uses a similar writing system). Some participants went even further, learning English, which uses a different writing system. The Lhomi program has demonstrated that best practices of language acquisition for children can be relevant for teaching adults as well, a finding that makes the local community, funding partners, and government authorities satisfied. The language composition of the local communities in Nepal shows that most of the schools are linguistically diverse, with the presence of two or more languages. And, the mother tongue-based multilingual education (MTB-MLE) program with a single mother tongue as medium of instruction fails to ensure equal access to quality education and linguistic rights for all students. Effective implementation of a MTB-MLE program depends on the appropriateness of the model in each school environment. Some innovative strategies have emerged in the multilingual classrooms from the continuous interaction between the principles of MTB-MLE and classroom language situations during the initial phase of program implementation. These strategies shared by Laxman Ghimire from Tribhuvan University, Nepal include development of multilingual textbooks, preparing multilingual teachers and allocation of school hours for each language in the classroom. His sharing added another insight that some other strategies were employed informally, such as policy negotiation and reformulation in the local context. Although these strategies have been emerged in the local context, it can be crucial for the development of an appropriate model of MTB-MLE in the linguistic and sociolinguistic context of Nepal. Education acquired through mother tongue alongside other languages, which is termed as multilingual education (MLE), is stable, that it greatly bolsters children’s cognitive development, and that it prepares them to face the challenges of real life through education in much more effective ways. The practice of MLE has shown that it is very useful for addressing global educational challenges like low participation and high dropout rates. The studies have already shown that use of mother tongue has powerful pedagogical and social justifications. Recognizing the profound importance of language for education and development, British Council has recently changed its position to English language teaching with a multilingual framework. Nepal, where about ten dozen languages are spoken as mother tongue can serve both as opportunities, and by virtue of it being a developing nation with limited resources and sticky political problems, as challenges for the implementation of MLE. Despite of linguistic diversity, Nepali is the sole official language used as the medium of instruction in primary education throughout the country. However, there have been recent initiatives on multilingual education in Nepal’s primary and adult education. The MLE policy is enshrined in the various constitutional and legal provisions in Nepal in relation to MLE-related international laws and human rights obligations. Nepal has recently shifted the monolingual ideologies and established linkage between Nepal’s MLE policies, plans, programs, and interventions and their manifestations in schools. MLE piloting and local-level initiatives have significantly contributed to developing models for MLE expansion and mother tongue based pedagogies in different languages with the focus on creating indigenized materials, setting strategies and processes, and identifying good practices that have shown visible results in multilingual classroom settings. In the context where community schools are shifting their medium to English from Nepali languages and guardian’s growing tendency of sending their children to English medium private schools, there are a lot of challenges of multilingual education in Nepal. However, the replica of best MLE practices along with local linguistic and cultural immersion, substantial awareness and advocacy at grassroots level and extensive MLE intervention for basic education and literacy class followed by proper joint monitoring by concerned GOs and I/NGOs could be the ways for effective MLE in Nepal. Acknowledgements: I am grateful to Mahidol University, Thailand and Multilingual Education Working Group (MLE WG) for providing me the scholarship to attend the international conference in Bangkok. I am equally thankful to Plan Nepal for creating conducive environment to attend the event. Thoroughly enjoyed reading it. I found some similarities with Elana Shohamy’s article, ‘Assessment in multicultural societies; Applying democratic principles and practices to language testing’ it tries to make democratic assessment of a language test in a multicultural society. Is it Literary rate of the community or …..